K1B = Knit into the stitch below the next stitch on your left needle - you will be dropping the next stitch off the left needle at the same time. This is a bit hard to understand written, so be sure to watch the video if you are confused. Repeat these four rows for pattern. 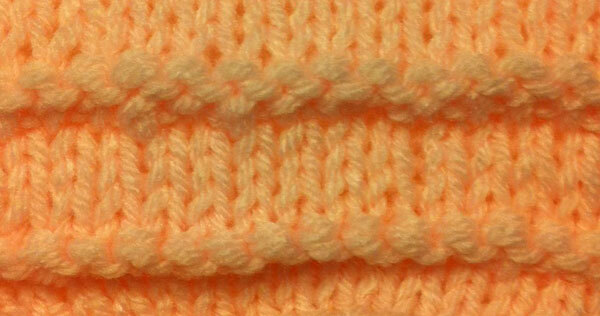 If you are a visual learner, below is a video demonstrating this stitch. Enjoy! 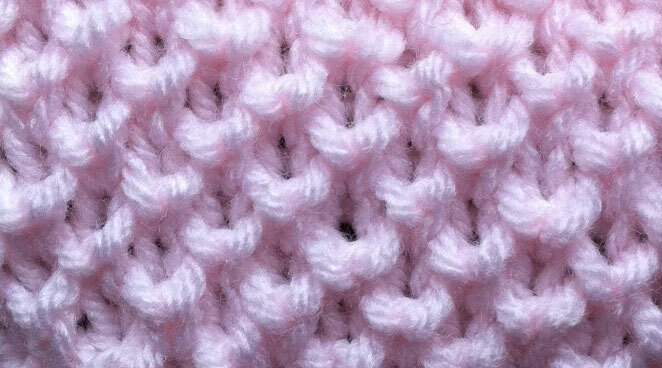 This particular stitch pattern reminds me of speed bumps. Easy to do and easy to remember, also. Beginning with a purl row after casting on, work three rows of stockinette stitch. Repeat these 6 rows for pattern. 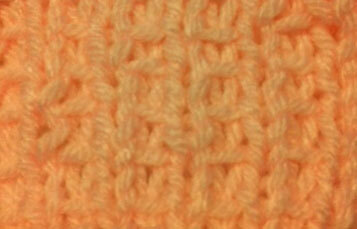 If you learn better by seeing, the video below demonstrates this stitch. Enjoy! If you would like to add cables to your work, but aren't ready to tackle something complicated, then this stitch is for you. It is a simple, two stitch cable, that you don't even need a cable needle for. 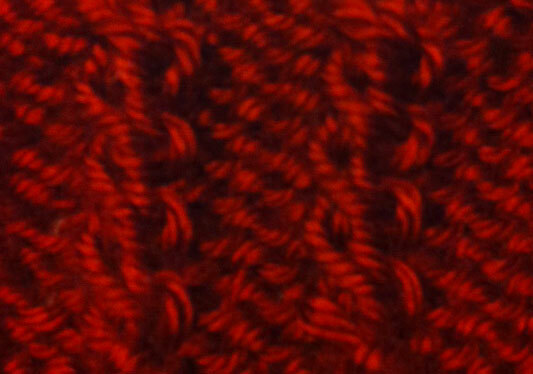 Work the cable(s) on a reverse stockinette background to make them stand out. This is a two stitch cable. All you have to decide is how many and where to put them! You can work on any number of stitches you like. You may want to put stitch markers before and after the cable stitches, just to help you remember where they are. Knit through the back loop of the second stitch on the left needle, but do not drop it off the needle. Next, knit through the front loop of the first stitch on the left needle. That's it. Continue working until you reach the next point where you would like to have a cable, and repeat: Knit through the back loop of the second stitch on the left needle, then through the front loop of the first stitch, and drop both from the left needle. Now, when you have finished the row and have turned your work, and come to those two cable stitches on the wrong side of your fabric, all you have to do is purl those two stitches. Simple! 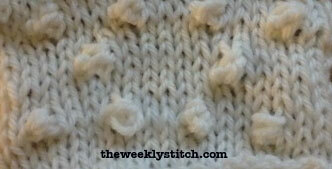 Want to see just how simple this stitch is? Below is a video to do just that! This fun stitch is much like a bobble, however, in my opinion, faster and easier! There really is no set pattern - you can place the popcorn stitches where ever you like. Place one here, two there... or grab some graph paper and chart out a nice even pattern for yourself. The choice is yours. Knit into the next stitch on the left needle, but don't drop it from the needle. Leaving the stitch on the needle, bring your yarn to the front of the work and purl into the same stitch. Leave the stitch on your left needle, and take the yarn to the back of the work, and again knit into the stitch. Don't drop from the left needle just yet. Once more, bring the yarn to the front of the work, and purl one last time. Now you can drop the stitch from the left needle. Knit until you reach the spot where you'd like to have another popcorn stitch, and repeat the above, turning one stitch into four. Now, when you've reached the end of the row, turn the work as you normally would. Knit until you reach your increased stitches. You need to decrease these 4 back down to 1. Simply slip the next 3 stitches from the left to right needle. Knit the 4th stitch. Now, pass the slipped stitches over the knit stitch, one at a time. You now have 1 stitch again. Repeat for all popcorn stitches. And there you go! If you are having a hard time picturing how to do this stitch, here is a video to help you out.